An architects impression of Fairhaven as proposed in 1892. The carriage drive over the sea wall would have extended to St.Annes. 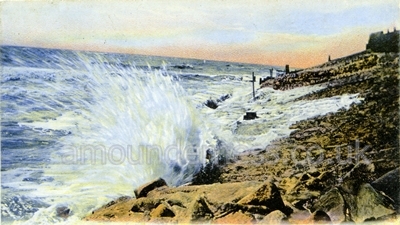 The dunes along Clifton Drive at Fairhaven were to be levelled and streets formed so that building plots could be sold. Running roughly parallel with Clifton Drive a promenade road was constructed which would eventually join St.Annes Promenade near the Grand Hotel. 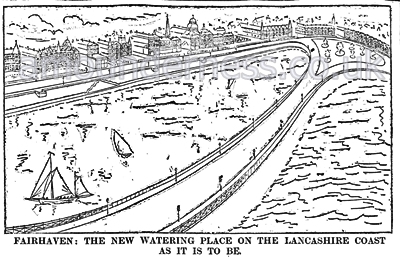 The Double Stanner was enclosed to form the present Fairhaven Lake but plans for a wide carriage Drive (a continuation of Marine Drive) over the sea wall was abandoned after several incursions by the sea. Originally there were plans to extend the sea wall, lake, gardens and carriage drive along the coast to near the Grand Hotel in St.Annes. The cost of maintaining the sea wall would have been prohibative so the sand dunes between St.Annes & Fairhaven were saved. Plan of the Lytham end of Fairhaven Estate and proposed road layout, 1892. Plan of the St.Annes end of Fairhaven Estate and proposed road layout, 1892. The lighthouse and cottages are shown on this plan with Lightburne Avenue and Fairhaven Road to the left and Alexandria Drive and Clifton Drive above.